You will never guess what I did this weekend – go ahead and try, I’ll wait…do you have your guesses ready? Great. Now throw them in the trash and slap yourselves because you’re not even close. What I did was so ridiculous that you need both ear flap hats and Teflon shoes to participate. If you’re guessing it was a Moon walking class in Saskatchewan, you’re close, and we have some lovely parting gifts for you, but no – I went curling! “Curling”, for those of you who may have been living under a rock, or “stone” for the last hundred years or so, is a ‘sport’ in which silly Canadians (is there another kind?) slide large hunks of granite around on sheets of ice in a game similar to giant shuffleboard – but with fewer elderly people. Once the stone is sliding, two more Canucks run on ahead of it, sweeping the ice vigorously to clear all the pinecones and beaver poop out of its path. Initially I assumed this sport was developed as a result of extreme cabin fever being combined with large quantities of Labatt’s, but it turns out that the sport did not, in fact, originate in Canada. Comprehensive research indicates that curling was actually stolen from the Scots during the infamous Maple-Kilt conflict of the late 1750s, when – in a story known to every Canadian boy and girl – the brave Mountie Norbert Tremblay climbed atop his trusty moose, and rode silently into the enemy camp under cover of darkness, and wide-brimmed hat. His covert mission that night was to find a way to break the enemy’s spirits, which he accomplished by stealing both their giant recreational rocks, and their undergarments. This of course led to the modern Scottish tradition of wearing kilts without underwear – however, hardened as they were by their terrible cuisine and bearded wives, the Scotsmen simply couldn’t handle the wintery Canadian breeze whistling ‘round their giblets, so they gave up and hopped the next flight home, thus ending this bloody conflict. This victory marked the last time a foreign nation ever invaded Canada, and was made all the more impressive by the fact that the Mounties weren’t even established until 1920. However, tensions still run high between the two nations, particularly during the Olympics, where it is not uncommon to see the Scottish team engaging in gratuitous mooning of the Canadian delegation, occasionally even from the medal podium. With rivalries like this, it’s plain to see why Curling is a much more riveting competition than, say, figure skating or cross-country skiing, and one that is definitely worth trying. Imagine my excitement then, when I heard a coworker talking about the St. Louis Curling Club and their “Learn to Curl” classes! I immediately recognized this as a once-in-a-lifetime opportunity – like overhearing a supermodel say “I just wish I could find a goofy, normal-looking guy that loved me for my looks!” – so I rushed home right away to sign up for a class, and boy am I glad I did! My curling experience began with the following warning: “Ice is Slippery.” (Apparently lawyers like to curl too) We were then warned to “take small steps”, “keep our bodyweight over our feet,” and “not lick our brooms to see if our tongues would stick.” The last one I read more in their tone, but regardless, once we’d covered the basics and applied no-slip rubber covers to our shoes, we were ready to get on the ice! The main facilitator did offer one additional insight though, and that was this; raising his leg about knee high he said, “This is about as far as I go – you don’t need to be flexible to curl; that’s a myth.” You can imagine my relief, as that had obviously been a major concern – if you were to say, pull your groin in an activity as benign as curling, you had better hope you can come up with a better story before your friends start asking questions. You’d never hear the end of it if they learned the truth. They’d be all like, “Maybe you should try something safer, like knitting,” or “Better stick to playing checkers at the park, old man,” at which point you’d have to wait until they came into swinging range and savagely beat them with your broom. Actually, my main concern was slipping on the Teflon shoes they’d mentioned and cracking my head open on the rink in front of a bunch of strangers…though on the plus side there wouldn’t be much swelling, because you’d immediately have ice on the injury. Those Teflon shoes were actually pretty neat – you know the scene in Christmas Vacation where Clark Griswold sprays the bottom of his saucer sled with a friction-reducing agent and then leaves a flaming trail down the sledding hill? These shoes were roughly that effective. Technically you only get one, which allows you to glide effortlessly forward in a graceful lunge as you release the stone – if you’re a professional. If you’re a beginner, what it allows you to do is wobble awkwardly back and forth before tipping over on the ice and launching your stone into the neighboring game. If you’re lucky, you don’t blow out a knee. The other thing I noted during this class was the constant assurance that the rules being explained were in place because people had gotten so good at curling that they could basically perform superhuman feats that would’ve rendered the game pointless if not strictly regulated. For instance, the sport was forced to institute a rule stating that a thrower must release the stone prior to crossing the “hog line” because otherwise a really good curler would be able to slide all the way (138ft) across the “sheet”, placing his stone on the “button” in the “house” near the “kitchen” which is just down the “hall” across from the “powder room.” All this would be accomplished while making snide remarks in both English and French, per National Canadian Curling Association (NCCA) guidelines. As a point of reference, with a very solid shove, I was able to propel myself just up TO the hog line, which I initially felt pretty good about. Based on this fact, I imagine that elite curlers have launching thighs that are roughly the size of elderly tree trunks. 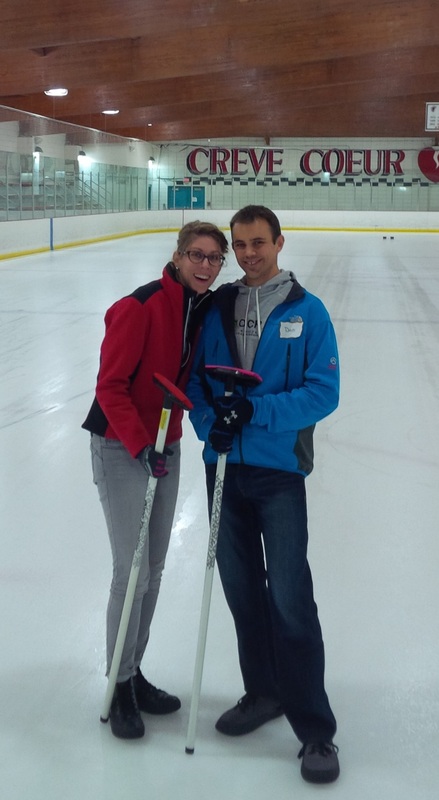 As the night went on and we learned to throw, score, and strategize, it became obvious that – while much better than us – our instructors were not exactly your elite-level curlers. It turns out they were just a group of friendly guys with a goofy hobby they wanted to share. That kept the class pretty casual, which was good, because had they taken it very seriously, my partner and I surely would have been removed for giggling every time we talked about “handling our stones” or “curling on sheets.” All-in-all it was a very entertaining experience – after the lessons we got to play a quick round, and I would’ve stayed a lot longer if we hadn’t been chased off by a group of hockey players. I highly recommend this experience, and hope to go back myself. Just remember when you go to pause for a moment to remember the brave man that risked life and limb to bring this noble sport to the continent so many years ago – you’ll need that moment to rest anyway, because all that sweeping is exhausting. Is that a genuine O’Cedar floor mop you are holding in the last picture? CHEATER!! !